Imagine, if you can, a world without football. You’re aware of such a thing as *a* football, a round thing full of air that’s fun to throw, kick or chase around, although you don’t completely know it by name. Beyond that, though, nothing. No Manchester United, no Tottenham Hotspur. No Real Madrid, no Barcelona. No FA Cup, no World Cup. No pitch markings, no corner kicks, no laws of the game. No Richard Scudamore, Garth Crooks, or Jamie Carragher. No Hope Powell or Caroline Barker. No Carlos Alberto or Ferenc Puskas. There’s just you and a round thing that you occasionally kick around or throw somewhere that you can’t reach and have to ask someone else to get it for you. Welcome to my son’s experience of the game of football. Dylan Edward King arrived into the world two years ago last month, and at some point over the next few days or do his world is going to change in ways that he is currently incapable of understanding. Over the last few days, he’s been couped up in our poky flat, amusing himself with his toys and books, largely oblivious to the changes that are coming. This afternoon, though, I’m taking him to his first football match. It’ll be an education for both of us. For me, this is a first taste of how the majority of the rest of my football-watching life might be. But this palls in comparison with what this will be like for him. The crowd, the noise, the sights, sounds and smells will all be completely new territory for his currently sponge-like brain. He probably won’t understand hardly any of what’s going on, but that’s not really the point. For him, the world is about to change in one of the most fundamental ways imaginable. He’s going to be a big brother – the due date is the following day, and everybody is on high alert, even though the new arrival hasn’t shown any signs of wishing to present himself to us just yet. The entire world, whether he likes it or not, can’t all be about Dylan forever, at least not without sharing that limelight with someone else. This afternoon, then, is for him. An afternoon out with his father while his mother gets a much needed few hours rest from his constant stream of half-babbled, half-spoken questions. Meanwhile, Worthing FC have had about as disastrous a start to the season as it’s possible to have. During the summer, it was confirmed that the club’s 3g artificial pitch wasn’t, after repeated issues over the last couple of seasons, up to scratch. The club has had to play every home game to this point twenty miles away, at Bognor Regis Town’s Nyewood Lane. The effects of this have been deleterious. The club has already lost its manager and a clutch of players, and they’re rooted to the bottom of the Isthmian League Premier Division table with just two points from their opening thirteen matches of the season. Today, however, marks the homecoming. Admission prices have been reduced to just a fiver, and a big crowd is expected for what would otherwise likely be considered a run of the mill fixture against Metropolitan Police. Of course, it’s easy to forget that one of the biggest problems with going anywhere on foot with a toddler is that you have to walk at the pace of a toddler in order to get to where you want to go. It is, therefore, not entirely surprising that we arrive at Woodside Road fifteen minutes late to find Metropolitan Police already a goal up, even though we left home twenty minutes before kick-off for what might otherwise have been a ten minute walk. We’ve ambled up the road at an amiable pace, stopping to admire the choo choo trains passing through the level crossing near the railway station, pausing to examine the stones in somebody’s front garden, slowly meandering towards the game as though it’s the least important thing in the world. And in a sense, it is. His mother’s due date is the following day, and every few minutes I’m checking my phone for the flashing light that will indicate a message advising me that the time is upon us, that it’s time to scramble and hit the hospital. This afternoon, though, my phone stays largely quiet. It’s a warm October day, the sort that makes you wonder whether autumn is ever going to show its face at all. Today is a day for meandering. We take a seat in the main stand for the first half hour of the second half. Dylan is excited by being quite high up – although this could be a side-effect of too much orange juice and too many chips – but fifteen minutes into the second half he’s jolted somewhat when Worthing take a two-one lead. 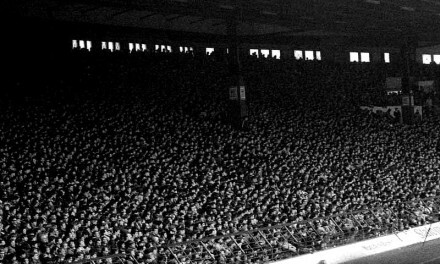 The roof covering the stand coupled with the concentration of people and the cathartic release of having taken the lead makes the volume of the cheering much louder that it was for the first goal. Dylan, for a moment, looks irked, as though he may be about to have a moment, but a potential incident is averted when I cheer him. He sure loves praise, does that boy. With around ten minutes left to play, we descend the steps of the stand and walk around the perimeter of the pitch to one corner of the goal that Worthing are attacking. There is drama on the pitch. Two Metropolitan Police goals in four minutes puncture the air of positivity around the ground – the crowd, as an aside, is announced as a healthy 855 – with five and two minutes to play respectively. I talk briefly with another father, possibly around the same age as me, as our respective sons – about the same age each other – play next to each other without truly interacting, in that way that two year olds do. And then, in the dying moments of injury-time, there’s further drama when Worthing are awarded the sort of penalty kick that home teams occasionally are in the closing stages of matches. I eye the boy nervously for a second. What will his reaction to all of this be? The ball is smashed into the middle of the goal to save the home side their first goal of the season, and the boy is delighted to look around and see everybody cheering him for the third time that afternoon. Seconds later the full-time whistle blows, and we amble back home at an agreeably snail-like pace. On the way, we stop at the same garden that we did on the way to the game, earlier in the afternoon. This time, I let him pick up I let him pick up one of the stones that has, through the endlessly fascinating machinations of the two-year old brain, particularly caught his attention. Once we get home, he gives it to his mother. You’ll be unsurprised to learn that I spent a considerably greater part of Saturday afternoon watching my boy than I did the football match that we were in the presence of, and not entirely from a viewpoint of his safety. He can’t take in a football match in any sense that would be meaningful to those of us that have been watching the game for forty years. He can’t. He’s too young. But he takes it all in with a wide-eyed wonder that I envy. We all carry baggage, from sport, from politics, from our families, from life, and it can feel exhausting, at times. Maybe he’ll become as gnarled and grizzled, as restless and dislocated, as jaded and cynical as the rest of us over time. Perhaps this is what “maturity” really means, the accumulation of a collection of insecurities and neuroses that come to form a cloud that masks the true value of everything that we do or see. Perhaps Dylan will likely feel a sharp pang of jealousy concerning his brother at some stage or another, but I hope he doesn’t lose his wide-eyed innocence for a while to come yet. I sometimes feel as though I need it even more than he does, at times. There’s a small array of photographs from our trip to Worthing vs Metropolitan Police for your perusal right here. Which Way Now For Liverpool?